Certain products sold on allegromedical.com are considered non-returnable due to hygiene issues. Hygiene items such as raised toilet seats, commodes, erection aids, pillows, cushions, bath safety, and personal care products are non-returnable. Due to manufacturer's return policies, titanium wheelchairs, custom wheelchairs and other custom equipment may be returned to Allegro for repairs only - no refunds or exchanges can be made at any time. 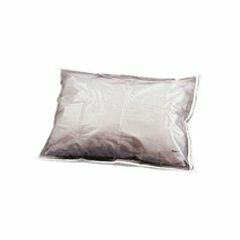 Heavy duty pillow protectors are recommended for allergy sufferers and people who have difficulty controlling saliva while sleeping. Zipper closure, easily washed. Measures standard 21" x 27" (53 x 68 cm). can't give a good review as I ended up not use because it wasn't what I thought it would be. We use multiple pillows to support my husband in his hospital bed to prevent bed sores. We were always worried about the pillows becoming wet due to incontinence but not anymore. These covers are great. These pillow covers will save your expensive down pillows and they are indestructible. Yes they make some crackling noise but worth it for the protection. Very strudy! Perfect for clinic use and patient care! The pillow covers make it fast and easy for staff to change pillowcases and remake rooms for the next patient. What kind of plastic is this. Is it soft and smooth or embossed? What a refreshing change! Doing business with you guys is a pleasure. My order got here a week before I was expecting it, and the merchandise is very high quality. And the prices? I paid half what I would have paid at the local drugstore. I couldn't be happier with my purchase. I'll be back.